This is an oval flange Goodrich Silvertowns porcelain sign. 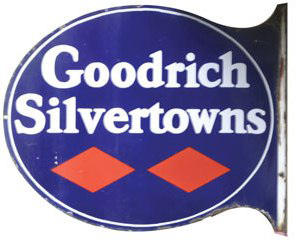 This particular Goodrich Silvertowns sign is blue with white text. It reads, “Goodrich Silvertowns” and features two red diamonds at the bottom.